This book presents a short and clearly structured overview of the morphological processes within the Bantu part of the Swahili lexicon. The purpose of this sketch is to provide the student with a handout for quick reference to the basic morphological data of this language. Part 1 ‘Derivation’ deals with the composition of the Swahili lexicon, while part 2 ‘Inflection’ discusses the grammar. 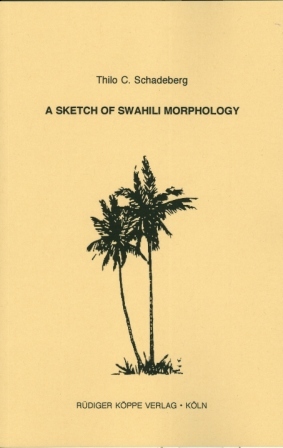 Schadeberg’s Sketch of Swahili Morphology presents a short and clearly structured overview of Swahili morphology. It is a useful handout for students who are learning Swahili but not an extensive reference book of Swahili grammar. It provides reference tables of various grammatical phenomena. (...) Finally I should like to commend the inclusion of typical Swahili sayings and expressions, e.g. maneno yaya kwa yaya ‘the same words over and over again’ (p.18), bwana mkubwa ‘Sir’ (p.21) and the number laki ‘1000’ (p.16).